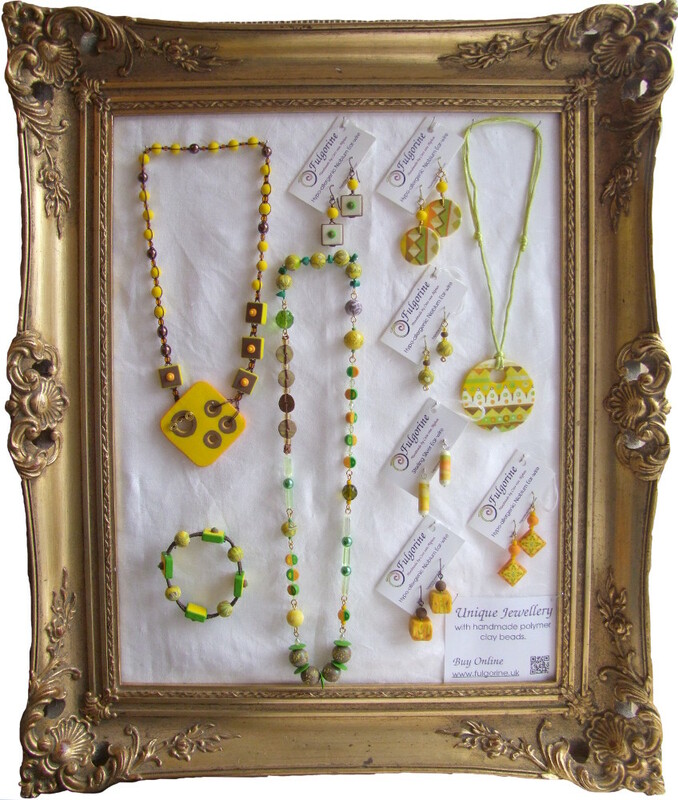 I have just listed a couple of new necklaces in my online shop. The first is one of my favourites. I made the beads back in 2016 (I made the necklace too, but I realise I didn’t post it online). The other is a restringing of a bead I made ages ago. 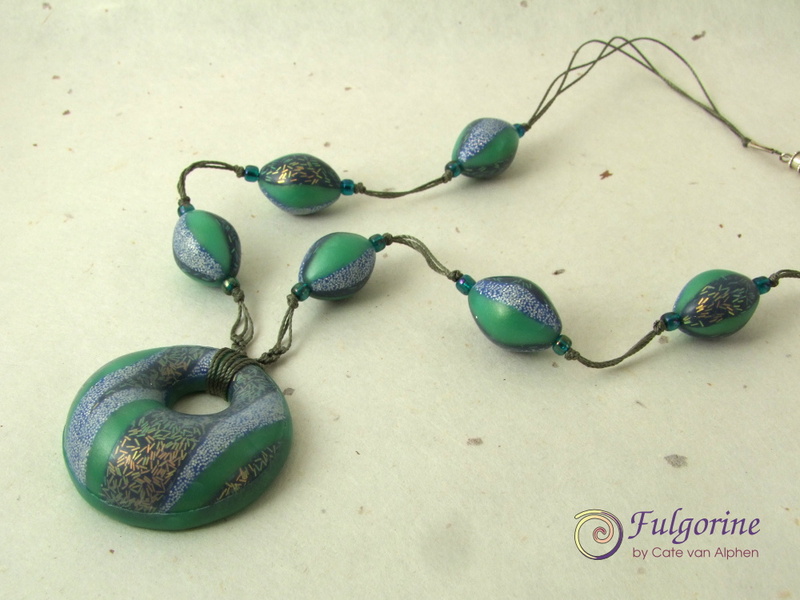 I think the simpler setting on a cable choker helps focus on the vibrant colours. 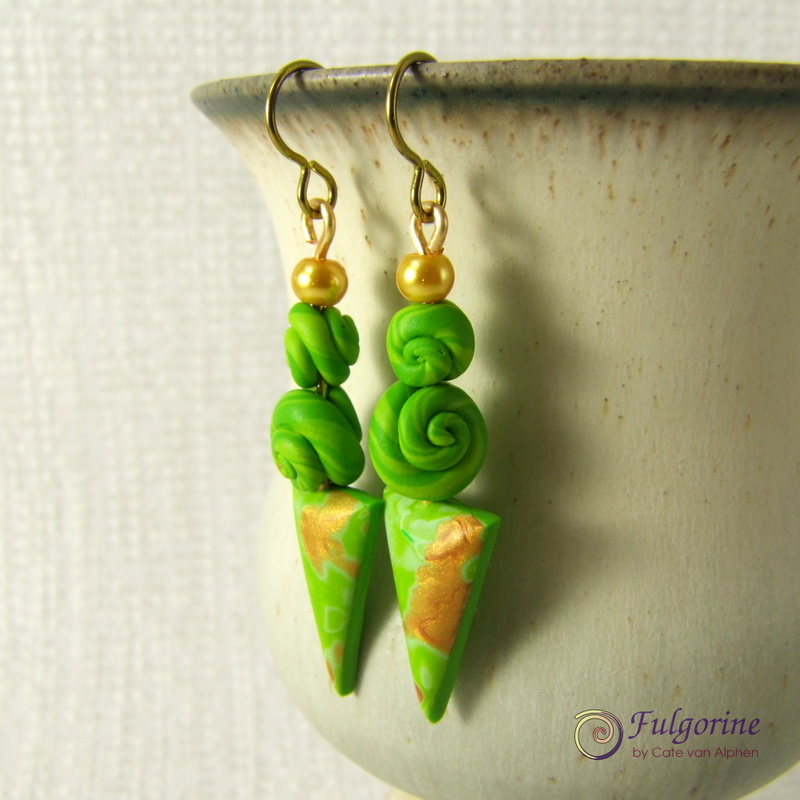 My favourite pair is these green ones with a new shape bead that I like to think of as snails. I’m tempted to keep them, but I don’t wear much green. Maybe I’ll make another pair in a different colour. 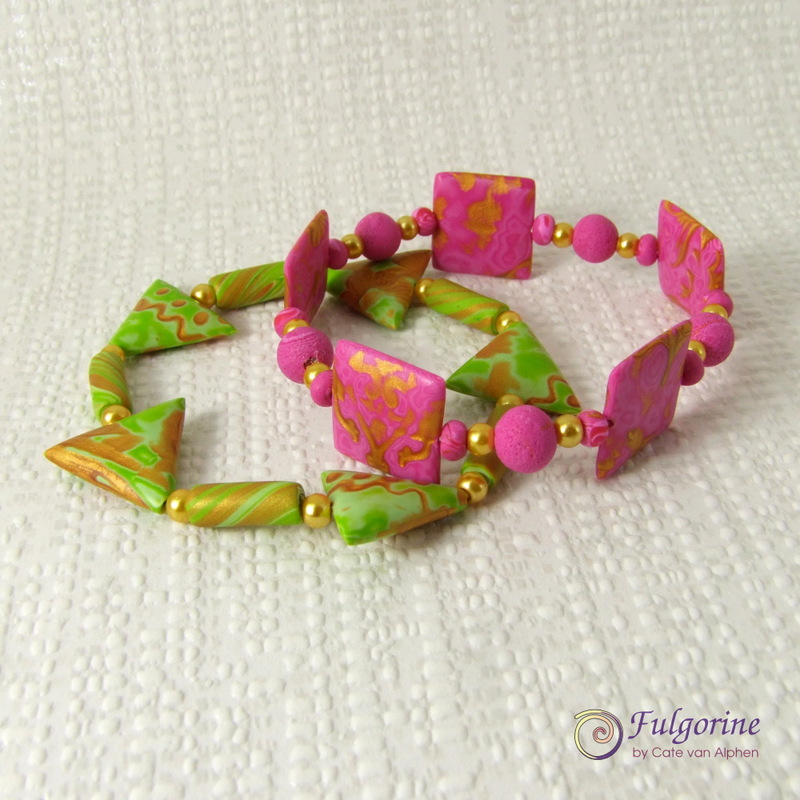 I’ve also made a couple of bracelets. I’ve just finished a commission for a wishpot which has helped me work out some of the technical issues I’ve had with stringing them. I began making these several years ago so I’ll show you some highlights in their evolution. Apologies for the quality on the older photos, I’ve tried to fix the colour balance. This mother of pearl effect wishpot was one of the first I made. It is strung directly on the necklace. The bead stopper can be lifted to open the wishpot. 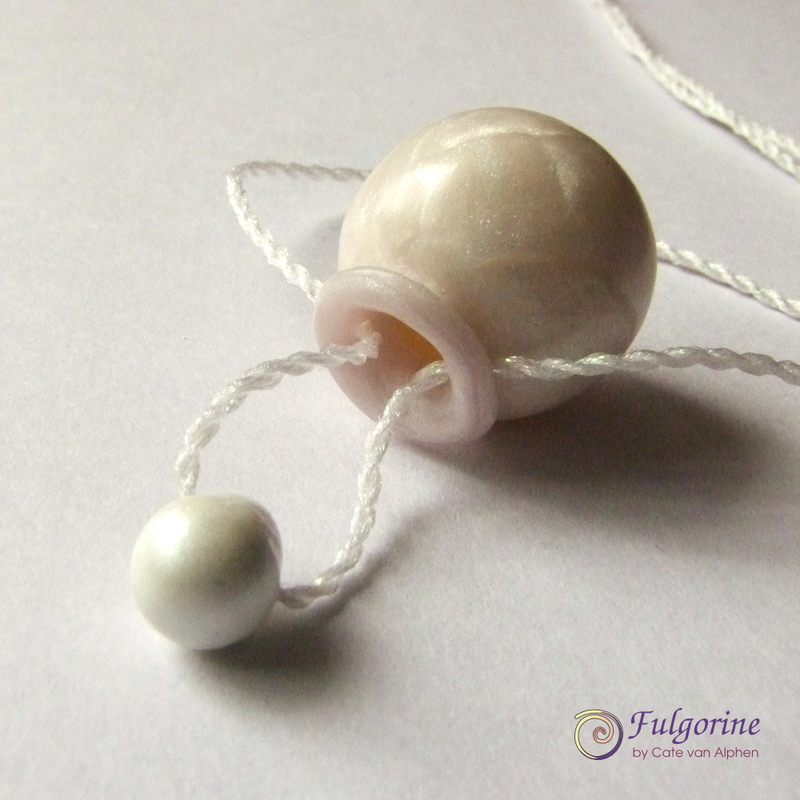 The necklace string keeps it in place when it’s being worn. There were a few things I didn’t like about this design. 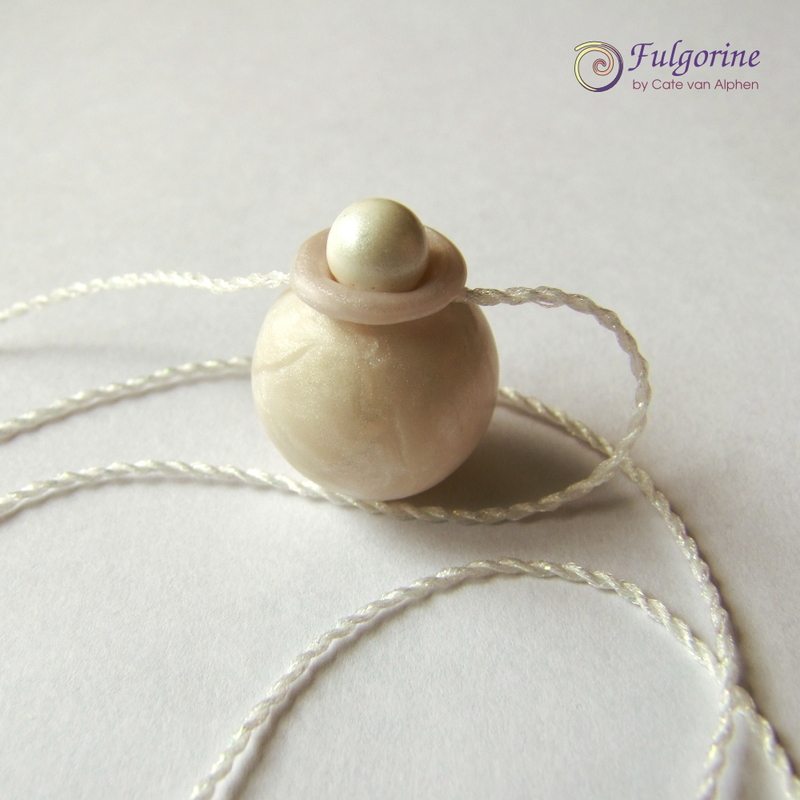 Firstly the necklace needs to be thin in order for the bead lid to be opened (the stopper bead plus cord on either side needs to fit through the mouth of the pot). Also unless it is a specific commission I get stressed about choosing the length for a necklace. For my next version, I wanted the pendant to go on a thicker kumihimo cord. Since there was no hope of this going through the opening of the wishpot, I put it on a ribbon that created a bail to hang on the necklace. I included lengths of ribbon in the necklace to link the design together. This version was better, but still not massively versatile – I couldn’t picture the ribbon working on something like a chain. 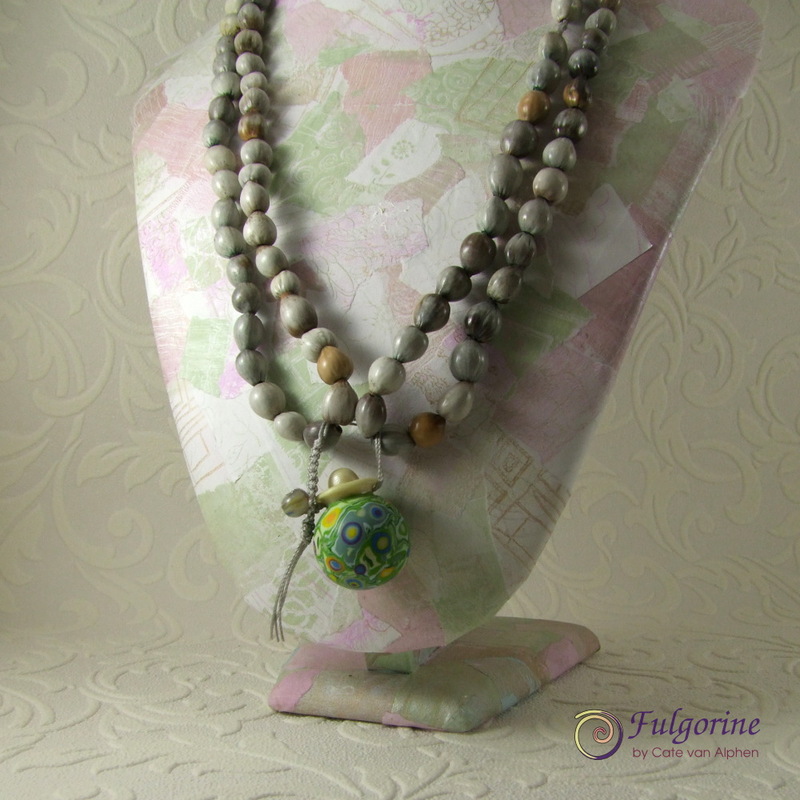 My latest necklace was for a wishpot on a mala necklace. I used beads made from imfibinga seeds. The necklace needed a specific number of beads which made it pretty long. 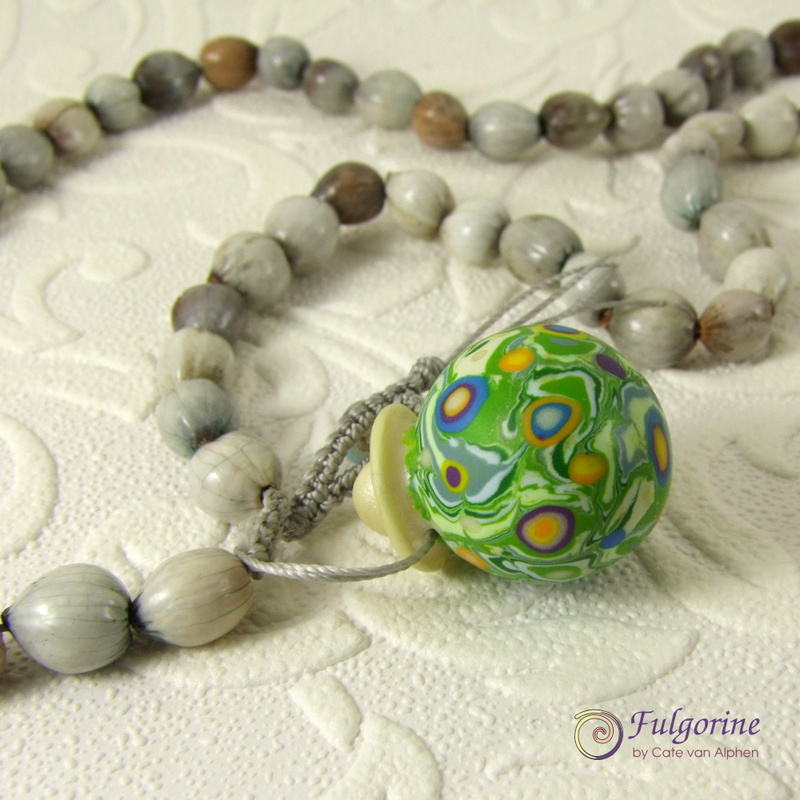 I wanted a way to allow the necklace to be shortened without adding a clasp. My solution was to add a button toggle to the wishpot attachment. 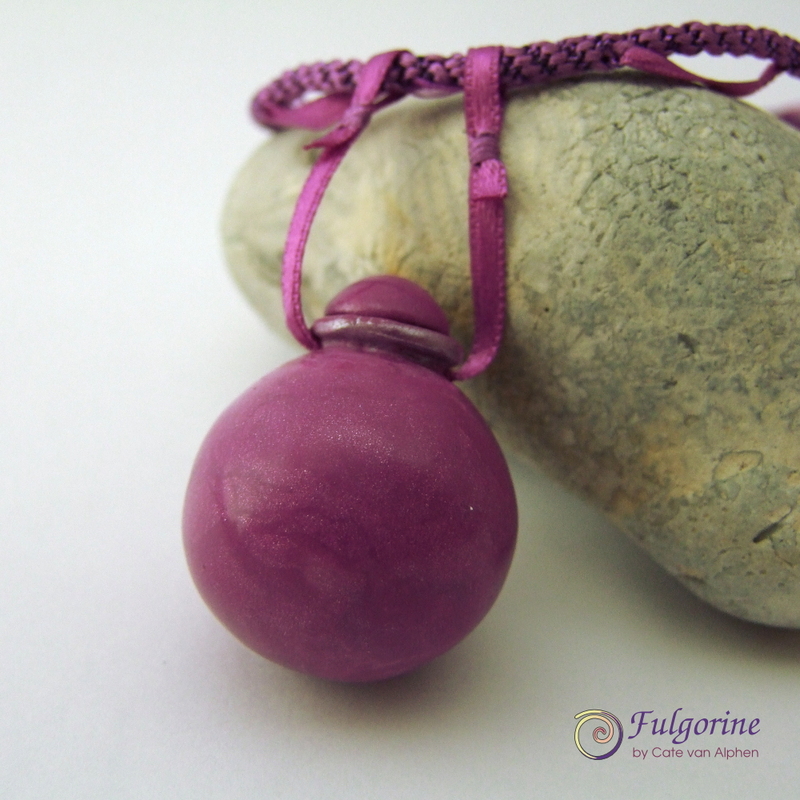 This means the necklace can be doubled over and the wishpot used to attach the two sides together. The wishpot can now also exist independently, so for example you could pop it in your pocket or wear it on a belt loop. The thin nylon cords still allow the pot to be opened. and the bead and macrame knotted button hole on either side keep the pieces together. Hooray! It finally feels like all the pieces of this design make sense! 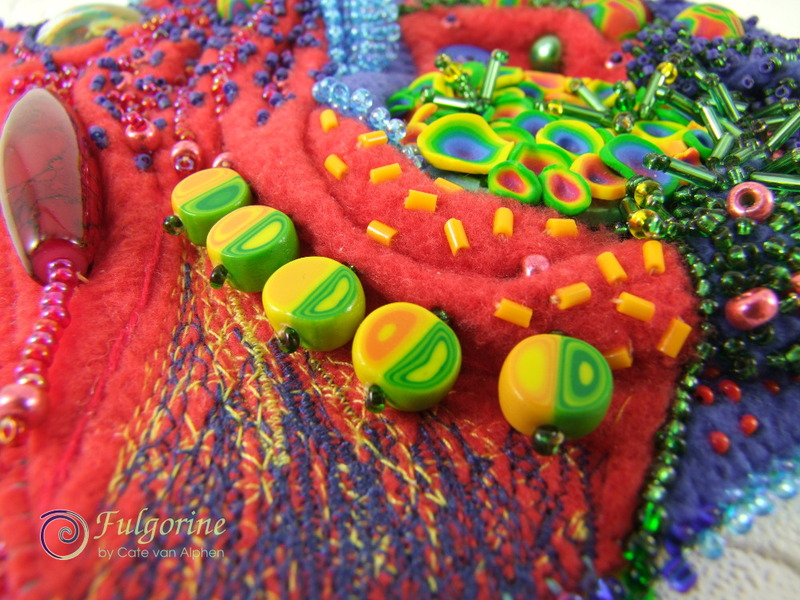 A few years ago I made a Bead Habitat. You may have noticed that all the pictures are fairly tightly cropped. This is because I hadn’t finished the edges. I had intended to frame it as a picture to go on the wall, but my mother objected, saying that it was too tactile for that and needed to be explored closely rather than hung from a wall. After that it got buried under all the debris on my beading table. As part of my recent tidying, I came across it again, and decided to finish it. 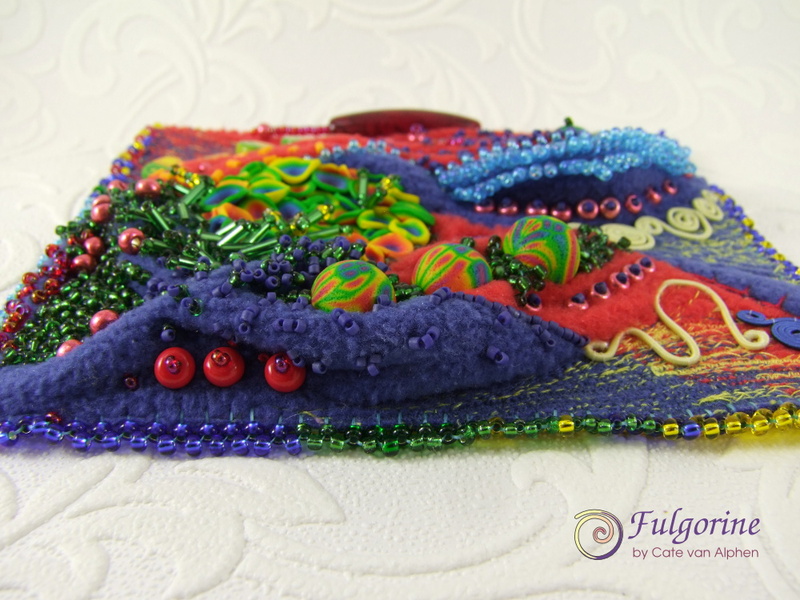 I’ve done a bead edging and a backing fabric to hide my workings. I had to try really hard not to embellish the back too! I’m not entirely sure what it is. It’s a kind of sculptural, 3D painting, abstract, mini landscape, ornament… thing. It’s purely decorative and quite small, so I’m thinking of it as “coffee table jewellery”. 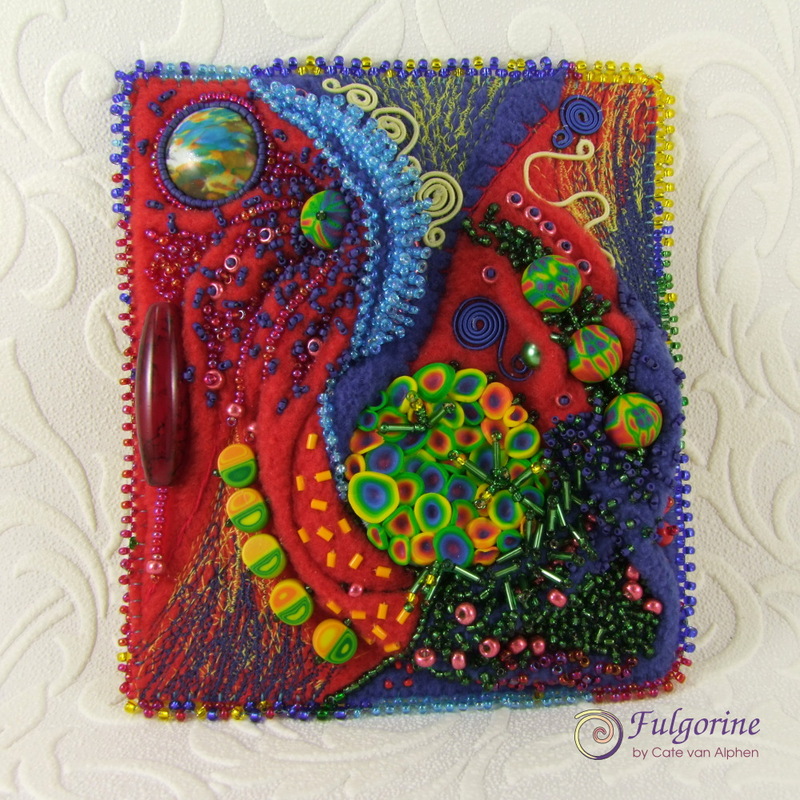 It’s a mixed media piece including some of my polymer clay beads and components, silk covered wire, embroidery and glass beads on fabric. 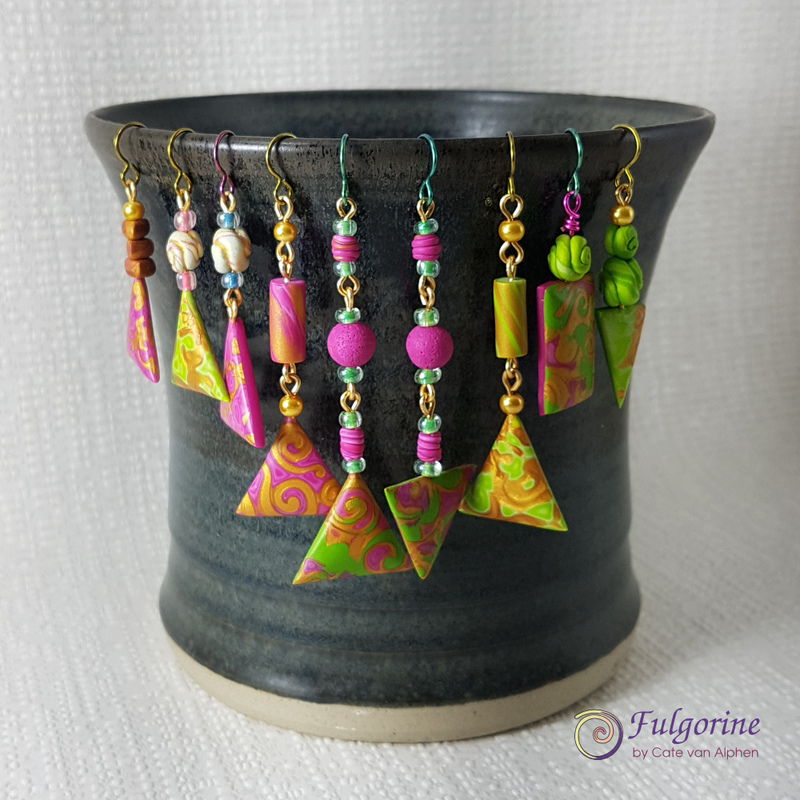 I have just listed this jewellery in my online shop, some of the earrings haven’t been available online before now. It’s been a while since my last blog, so here’s a look at my current project. 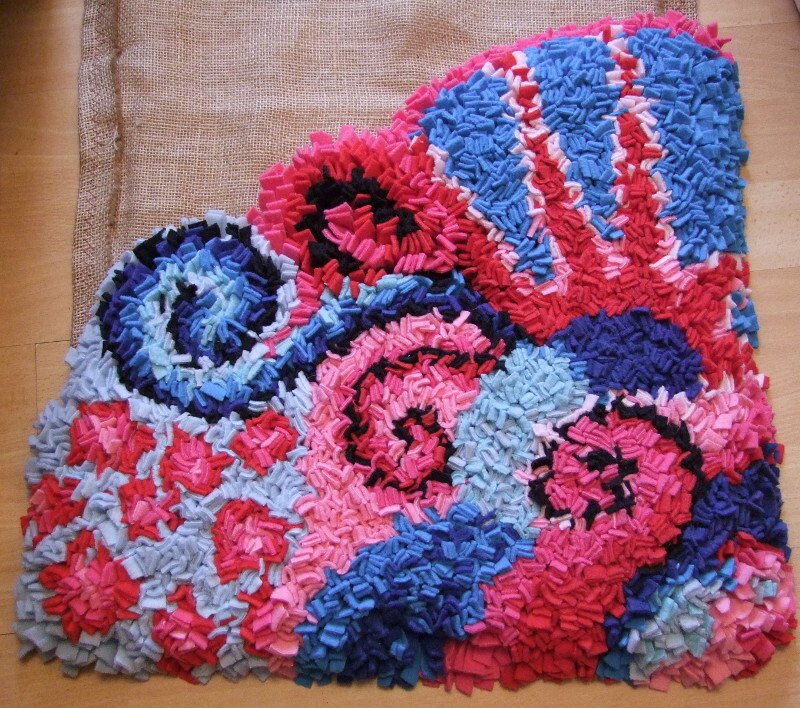 It’s a proddy rag rug. 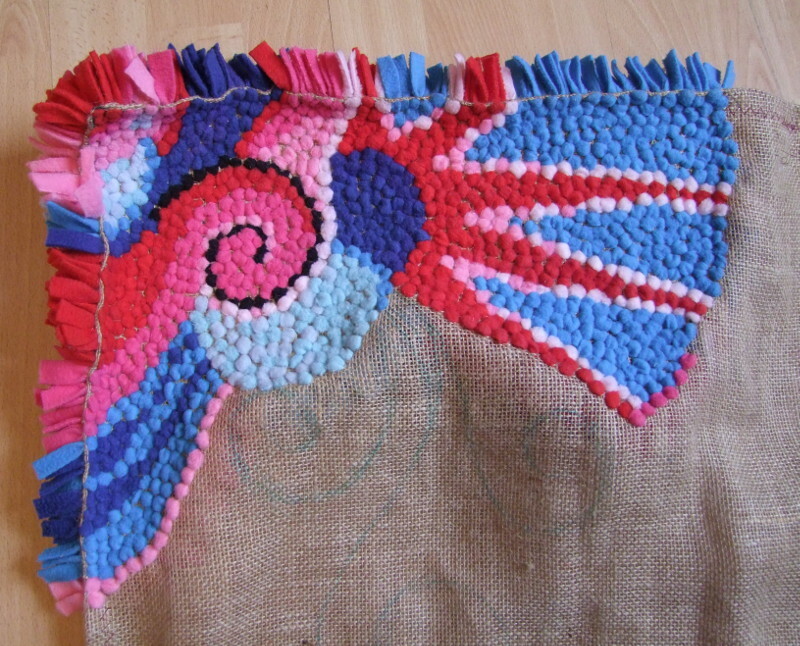 Inspired by hours looking at the rugs in Craftworkshop, I decided to give this a try since I have a lot of scrap fabric. Of course I didn’t actually look at any tutorials, I just looked at the rugs in the shop and guessed how they were done. I’m using scraps of fleece fabric and a knitting needle for the prodding. I’m not using a frame, but perhaps I should be, since it’s curling a bit on the back. 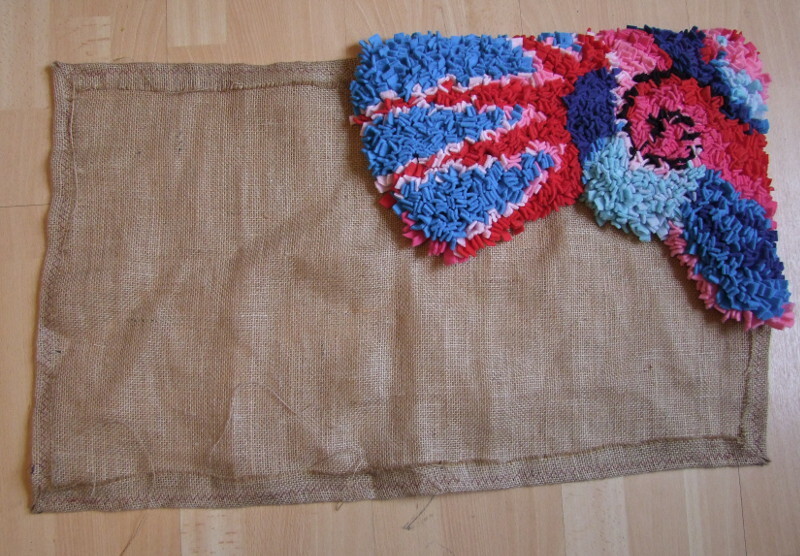 I suspect my scraps are a bit densely packed too, but I think it will be ok since there is a recess at my front door which I am making this to fit into. I’ll just jam it in and stomp it flat when I’m done. I’m doing an abstract design, just planning it as I go. It’s like a very slow motion doodle and is strangely addictive. Often I find it helps keep me interested if I don’t plan things out too fully. It’s also satisfying finding a way to recycle my scraps of fabric. And this pdf tutorial even gives instructions for making the tools you will need. 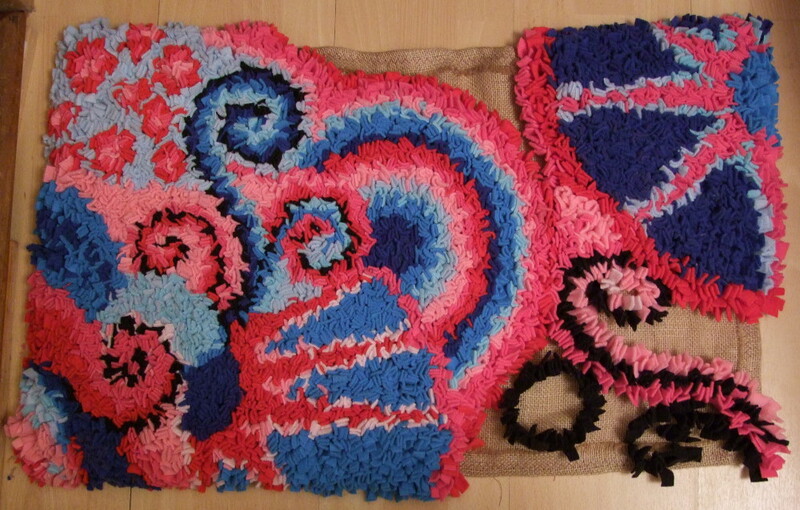 Update: Here’s a more recent photograph with further progress on my rug. 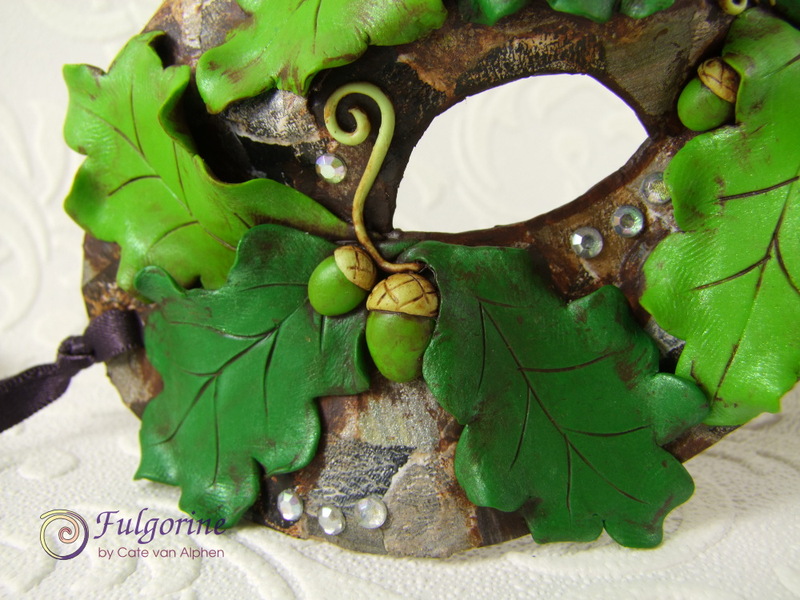 My husband’s Christmas party this year was a masquerade ball so he asked me to make a mask for him. 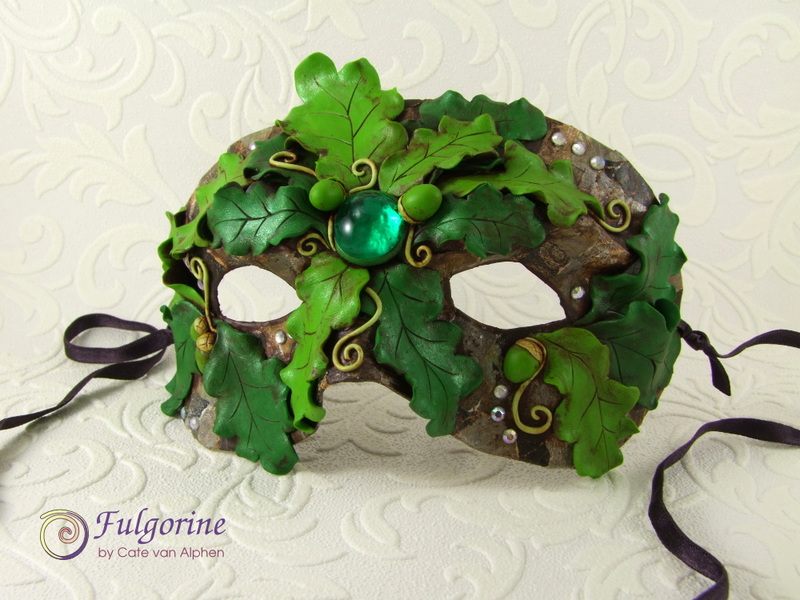 We decided on something inspired by the Green Man. The base of the mask is paper mache (I used layers of gum tape) with a final decorative layer of my mono printed papers torn into little pieces. 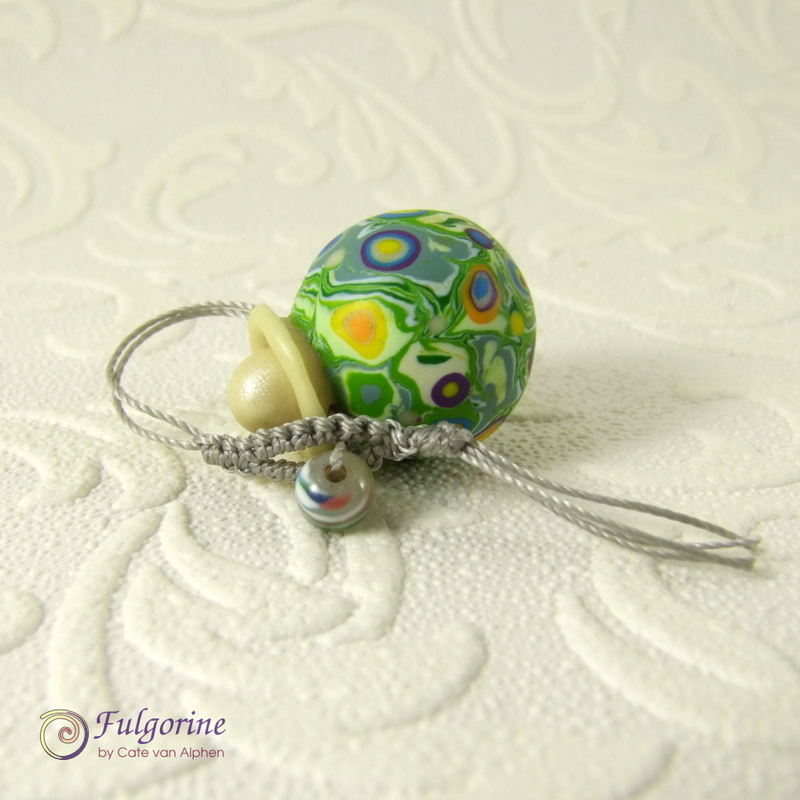 The leaves and acorns are polymer clay and there is a foil backed glass gem in the center. I also sprinkled in a few acrylic flat backs for some Christmas bling. It was a fun project. I’m tempted to make some more masks although I’m not quite sure what to do with the finished products since I find masks pretty creepy. 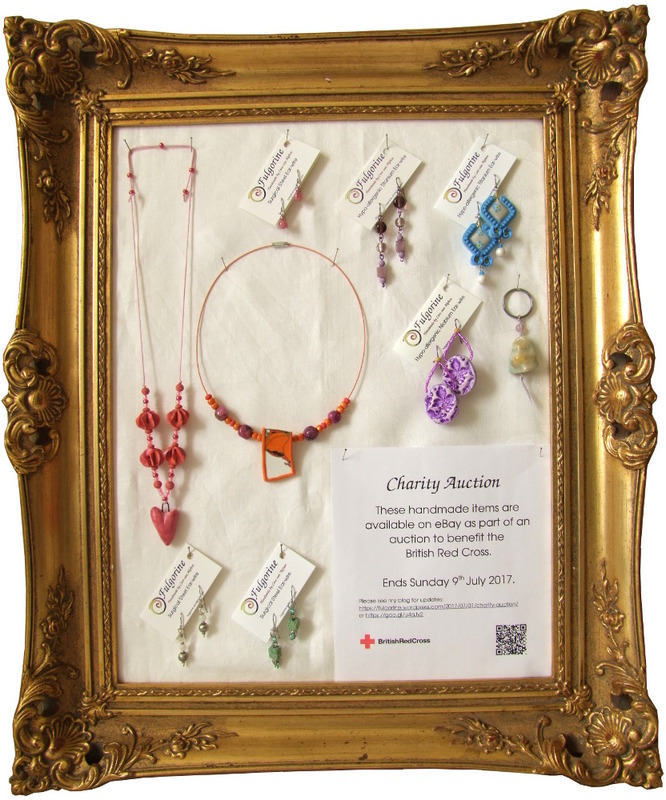 Here’s a reminder that my auction to benefit the British Red Cross will be ending tomorrow, Sunday 9th July. The British Red Cross assist people in crisis. Their current appeals include assistance for the people left bereaved, injured and homeless in the Grenfell Tower disaster and those involved in the recent UK terror attacks as well as people suffering from conflicts around the world. Please have a look at everything available and remember that the proceeds will be going to a good cause. The bids start at only 1 penny so you may get lucky and win a (practically) freebie. A few years ago I gave my sister a necklace. At the time I was experimenting with silk ribbon. Unfortunately, although the colour matched fantastically well there were some structural issues. 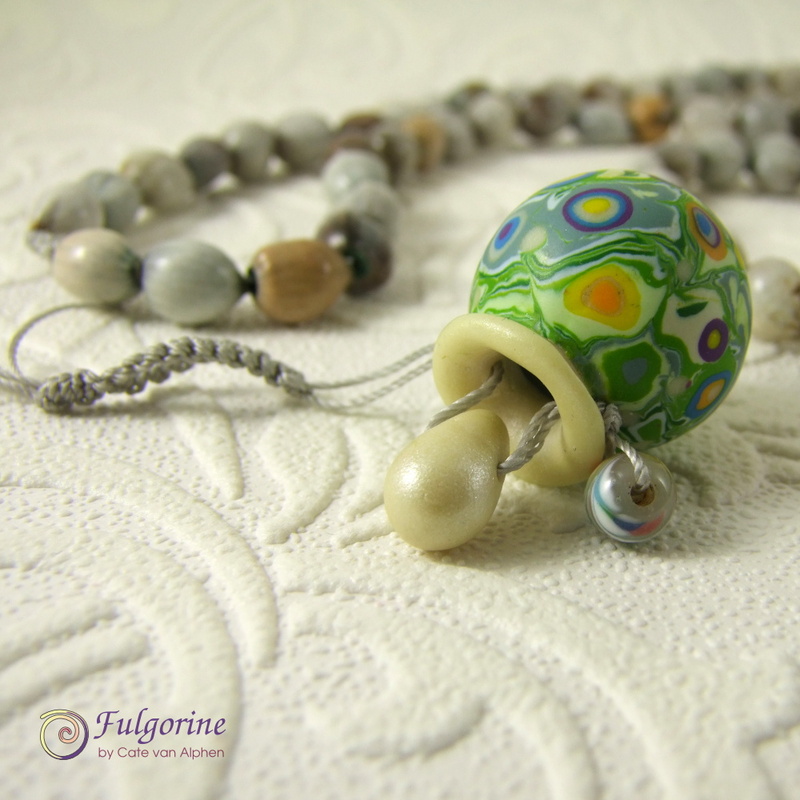 Firstly the beads were able to slip over the knots intended to separate them, secondly the larks head knot securing the pendant kept sliding to the back and flipping the pendant, and finally three years later the silk was not aging well. 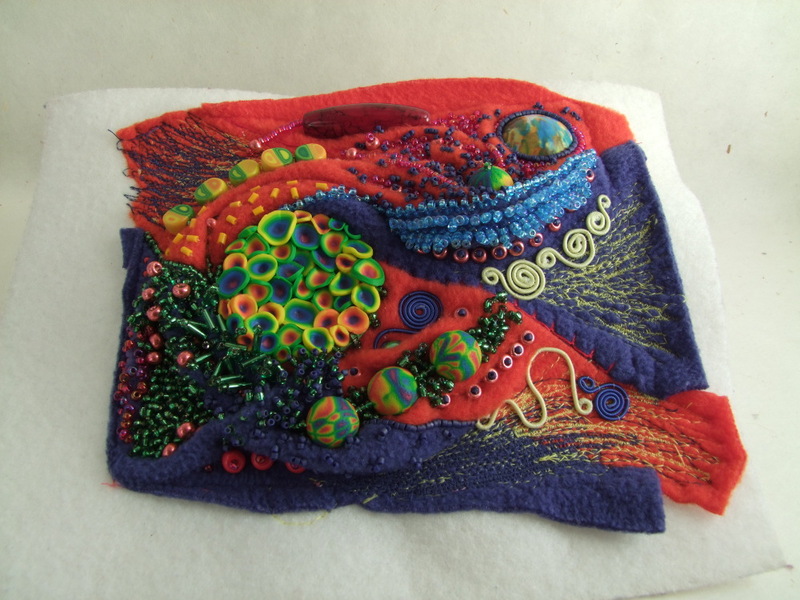 Before – beads strung on silk ribbon. Therefore I have just restrung it on some fine nylon cords. 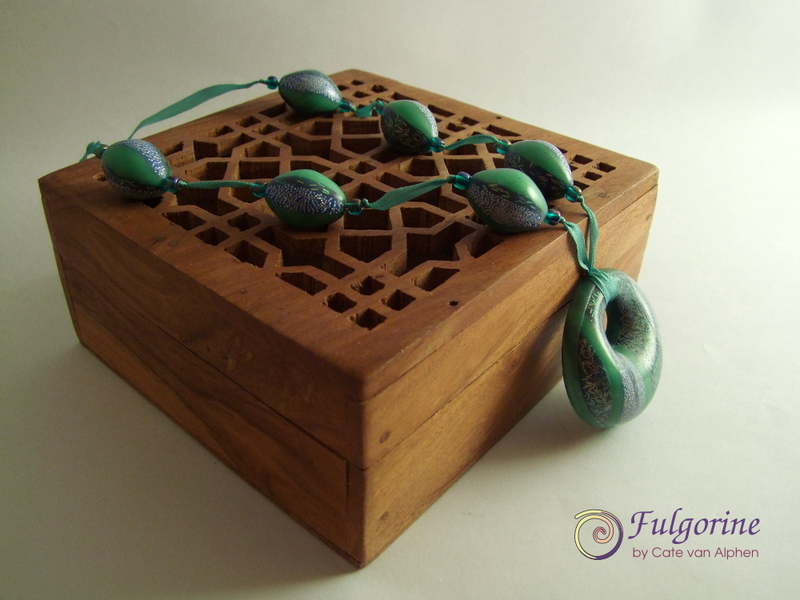 The colour is not as pretty as the jade ribbon, but I have included some macrame knots at the pendant which will hopefully ensure that it sits better. After – beads on nylon cord with macrame bail. 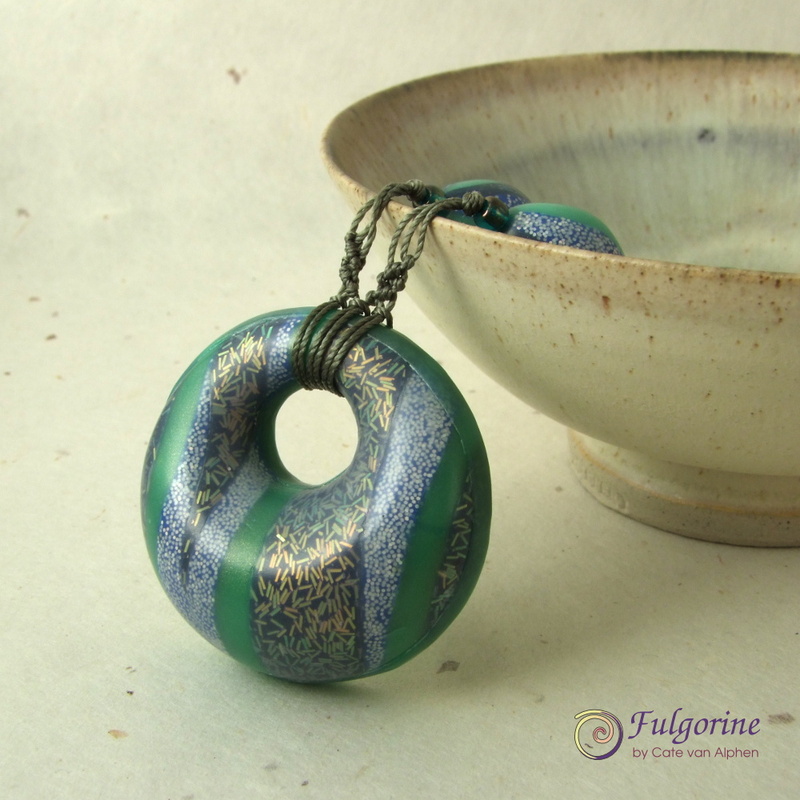 If you are interested, there is a free tutorial here on my blog where I make this polymer clay pendant.